Joseph Roubidoux established a trading post here in 1826 that soon became a fur-trading empire and later became St. Joseph in 1843. It remained small until the discovery of gold in California in 1848 when it became the headwater for the journey west. Civil War tensions led to the start of the Pony Express in 1860 and 1861, with St. Joseph becoming the eastern terminus. On April 3, 1882, Bob Ford killed the famed Jesse James in his St. Joseph home. The 1880s and 1890s became the golden age of prosperity in St. Joseph. Its mansions and traditions still remain a part of the city. The St. Joseph Symphony, Performing Arts Association and the Roubidoux Resident Theater are a few of our cultural attractions. 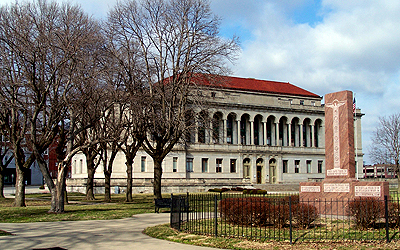 The Albrecht-Kemper Museum of Art houses one of the Midwest's finest collections of American art. The St. Joseph Historical Society operates the Roubidoux Row Museum while the St. Joseph Museum has an impressive collection of Native American artifacts. Also of interest is the Pony Express Museum, Trails West, the Apple Blossom Parade, the Sacred Hills Encampment and the Southside Fall Festival and Rodeo. We also boast a well-regarded public school system and many fine private and parochial elementary, middle and high schools. There's also a 4-year state college, 2-year private community college and a post-secondary vocational/technical school. Heartland Health is the product of the merger of 2 prominent, long-standing St. Joseph hospitals. Its integrated health delivery system includes a medical center, physician practices, foundation and a health plan. St. Joseph's Parkway winds through town for 26 miles and features walking trails and scenic overlooks. Northside Recreational Complex boasts a swimming pool, lighted tennis courts, softball, outdoor racquetball and playground. Bode Sports Complex features a 6-court outdoor lighted basketball complex, lighted in-line skate rink, 2 sand volleyball courts and more. Phil Welch Stadium is a 5,000-seat stadium that's home to a summer league baseball team. Hyde Park Recreational Complex is a 93-acre park with lighted tennis courts, swimming pool, horseshoe courts, baseball complex and more. Duffers will like the Golf Club, Fairview Golf Course, the private Moila Shrine Temple and Golf Course, Cool Crest Garden Golf and Triple Garden Golf Links. If you visit our area, your visit may soon turn into a lifetime stay. Give your children the chance to learn in quality schools and play in safe neighborhoods. Historic St. Joseph truly is one of the best places to live and work in America.